Adrenal fatigue is a very common and quickly growing problem of modern life. The stressors we are faced with on a daily basis all contribute to stress on the adrenal glands. People suffering from adrenal fatigue are much more likely to develop various other common diseases ranging from diabetes to cancer and heart disease and more. 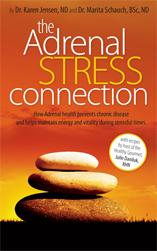 In The Adrenal Stress Connection Dr. Karen Jensen, ND and Dr. Marita Schauch, BSc, ND, explore how healthy adrenal glands prevent chronic disease and allow us to maintain energy and vitality even during stressful times. Also included are Twenty-Five Stress-Busting Recipes from Julie Daniluk, RHN, host of the Healthy Gourmet, for delicious and nutritious menu ideas to help you deal with daily stress. Click here to download the poster in PDF format.